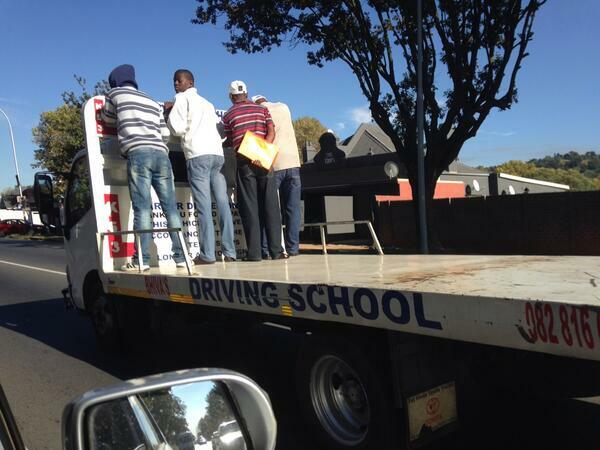 The driving School in question is Marco K53 Driving School which is owned by Marco Fourie in the Roodepoort area. I asked the gentleman again about the pickup and drop off service as I do not have a car and he reassured me that that is included in the price. The gentleman requested that I send him a WhatsApp with all the information regarding the applicant which I did shortly after the telephone conversation. I also paid in the R850.00 on the same day. On the 19th of December 2018 I still did not receive the training information. I send a WhatsApp and asked when the booklet will be delivered. He informed me that it was already late and that he will get back to me, which he never did. On the 20th of December 2018 I send a WhatsApp message again and asked when the booklet will be delivered. The gentleman advised that the booklet will be delivered the same day. Then I received a message stating that they could not find my address and I should meet them at Spur. I then phoned him and said that when I spoke to him telephonically, I specifically asked about the drop of and pick up service as I do not have a car. I then said to him that if it can’t be delivered, I want my money back as this is not what was agreed upon. He said that they will deliver the booklet and I said to him that I have another appointment at 2 pm and that they should please deliver before this time, which he said they will. I left for the my appointment and they delivered the material after the agreed upon time. I asked them regarding the appointment and I was forwarded a link to book myself. I then asked him if they will pick him up for the test and all of a sudden I had to pay in R200.00 more! I then confronted the gentleman and said that I have worked through the booklet and the information provided was also in the book I bought from CNA (which is false information provided), I also indicated that the pickup and drop of service was included in the R850.00. He then scolded me that I said he was a “thief” which is absolutely not true – because I was not there to receive the package myself. He proceed to tell me that I will not get any money reimbursed and that I should rather look for another driving school and blocked me on WhatsApp. I find this kind of behaviour very unprofessional and I feel that I was given false information when I phoned in to inquire about the driving school. I would like to be reimbursed the full R850.00 I paid as all the information provided in the training booklet IS in the book I bought. I feel that I was given false and misleading information for the start. You are welcome to contact me at any time for further information; I can be reached on my cell phone. See Hellopeter for more complaints about this driving school. One of my own pupils reported that a friend of his was sitting on the back of a bakkie, like this, on the edge, when they pulled off at about 20 km. He fell off, cracked his skull, broke his nose and suffered brain damage. What a complete lack of understanding to see a driving school doing something like this. We have been saying it for years. We need a training centre for driving instructors as a matter of great urgency. Every person presently earning a living as a registered driving instructor, or as one of the great majority of about 96% of unregistered “driving instructors” should be given an extensive training course, where the basic law of the country is taught; then every aspect of practical driving including defensive driving. I have been speaking about this for 5 years but we keep being told by the National Department of Transport, Provincial Department of Transport (particularly in Gauteng); by the RTMC and anybody else that there is no money for a training centre, but the law demands in Section 28 C of the NRTA that we take refresher courses at a training centre approved by the Shareholders Committee. The Shareholders Committee consists of the MEC of every Province. Can anyone in their right minds put a child at risk like this – it is appalling! – BUT it is a driving school car !!!! A Facebook message from Wendy Watson on 27th January 2014. As I was driving home on the N2 this afternoon at about 17:00, I saw this Toyota Tazz CA 243-375, which belongs to “Street Wise Driving School”. I counted 12 Kids & 2 adults – total of 14 people in it! Unbelievable! Please share so we can get the word out about this driving school and I hope the owners get to see this post, no regards for children at all! Driving school vehicle inside the yellow edge line. 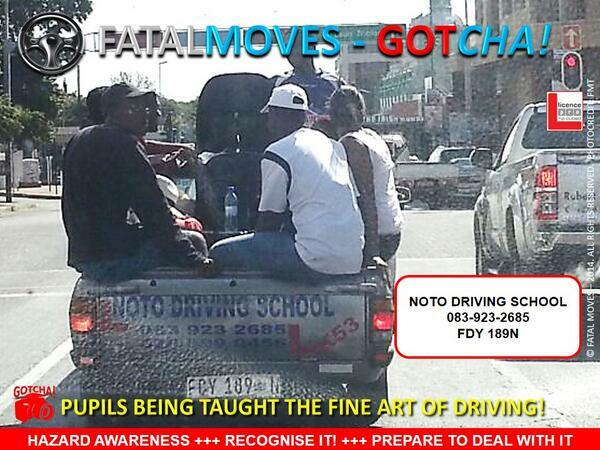 This is not the way a well-trained driving instructor should be driving – or training clients to drive. Indicates to the driver of a vehicle the left edge of the roadway and that, subject to regulation 298A, he or she shall not drive to the left of such marking. c) if persons and vehicles upon a public road are clearly discernible at a distance of at least 150 metres. Road Accident Fund – be on the lookout for a claim from Bhiva’s Driving School. These five guys are cruising for a bruising. There is nothing to keep these men safe as they stand hanging on to this flatbed type of truck. Any sudden unexpected movement or rough piece of road will send them flying, and smash their teeth on the bars in the case of a harsh brake. Stop pretending to teach driving guys. Start by educating yourselves first before you take money from the public for driving lessons.